Special Containment Procedures: An exclusion zone with a 10 km radius (Referred to as the "Green Zone" from 10 km to 7 km) must be maintained at all times around SCP-2249. Signs warning of extreme radiation contamination along the border of the excursion zone work to deter entry by civilians, however MTF Sigma-19 ("Park Rangers") is stationed at Outpost 16-2249 and polices the borders. Within 10 km and 7 km of the radius, any entrant may be removed without repercussion beyond a mandatory viewing of a safety video on the dangers of radiation. At 6 km from SCP-2249, a 3.5 m reinforced concrete wall topped with barbed wire blocks further entry into the exclusion zone (from this point on referred to as the "Red Zone"), the only entrance within being Outpost 16-2249. Travel within the Red Zone is only allowed with the use of specially designed vehicles to block radiation, as well as standard personal radiation protection equipment and ear protection. A guide from MTF Sigma-19 must accompany any research parties entering the Red Zone and SCP-2249. Multiple routes leading to SCP-2249 must be kept clear to allow for maximum viewing distance. Within SCP-2249, radiation protection equipment must be worn at all times, while ear protection is safe to remove within SCP-2249-1. Deviation from the pathway leading to and from SCP-2249-1 is to be avoided; in the event the pathway is blocked while trying to leave SCP-2249-1, personnel are advised to clear or scale the obstruction before any attempts to go around are made. Description: SCP-2249 is an extra-dimensional space approximately 4 km2 in size, located inside the █████ ██████'s Hospital in the former town of █████, Russia. The area within SCP-2249 resembles an old-growth pine forest, with plant life exhibiting signs of extreme malnourishment and light deprivation1. A dim grey "sun" is always stationary within SCP-2249's sky at a 12 pm position, providing a dull light. Space within SCP-2249 is looped internally; any subjects approaching SCP-2249's border will find themselves on the opposite border, with no signs of transition. Entrance to SCP-2249 is through an elevator on the first floor of the hospital, in which is a single Douglas fir (Pseudotsuga menziesii) on a bed of grass (Poaceea festuca). 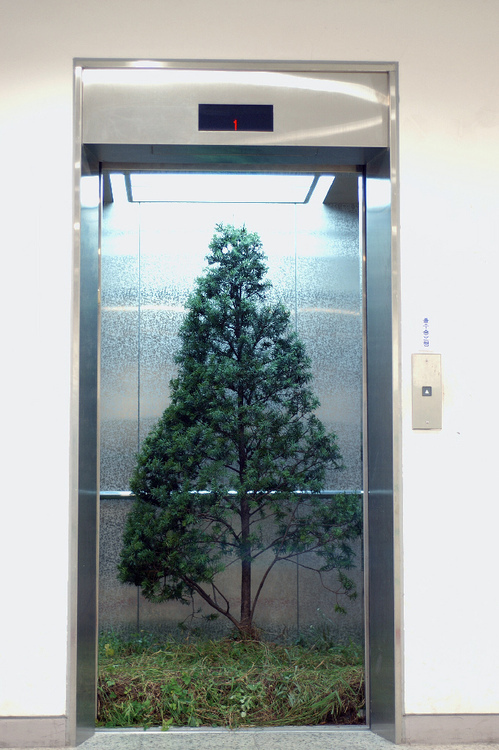 Pressing the button labeled with a small tree icon will take the elevator to the third floor, where it will open empty. Anyone inside the elevator is taken into SCP-2249. The elevator functions normally when used to travel to other floors, including the third. Travel within SCP-2249 is extremely dangerous due to instances of SCP-2249-2 both above and underground2 as well as a near complete saturation of gamma radiation throughout SCP-2249. Mapping the area within SCP-2249 has proven impossible, as most electronics cease to function due to high levels of radiation. The exception to this is a 1.2 km long pathway leading from the elevator entrance to SCP-2249-1. From the pathway to SCP-2249-1, multiple constructions can be seen, most suffering from heavy structural damage and general wear. Some of the constructs have been identified as a nursing station, a cafeteria, and a storage center. Also identified are two large sporting fields, a playground, and an empty swimming pool. SCP-2249-1 is the residence of Dr. Delroy ███████, the apparent creator of SCP-2249, whose body was found within3. Most of the space within SCP-2249-1 is filled with working machinery, notes belonging to Dr. ███████, and various scrap metal and wiring. Study of these notes has revealed that the machinery is intended to stabilize space-time within a certain area, granting protection from the instability the rest of SCP-2249 suffers from as well as blocking dangerous radiation. This device is functional, as evidenced by the stability of SCP-2249-1, the surrounding area4, and the path exiting SCP-2249. Research is focused on replicating this device or increasing it's area of effect in order to stabilize the entirety of SCP-2249. SCP-2249-2 is the designation given to multiple anomalies within SCP-2249, ranging in size from 11 cm to 1.67 m in diameter. SCP-2249-2 emit lethal doses of gamma radiation and exhibit a strong gravitational pull in their vicinity. Some instances exist simultaneously within SCP-2249 and the surrounding Red Zone, allowing energy to pass through unchanged. Matter that is pulled into an SCP-2249-2 from the Red Zone is deposited into SCP-2249 highly compressed, while matter pulled from within SCP-2249 never emerges. Instances of SCP-2249-2 that do not exist in the Red Zone as well appear visually as a black void, with neither light nor matter emerging again after entering. SCP-2249-2 can be mobile, moving at a maximum observed rate of 0.63 kph in random directions. SCP-2249-2 also accompanied by what has been described as a loud "roaring" noise, peaking at 152 dB. To date, there are a total of 457 confirmed instances of SCP-2249: 163 mobile instances, 294 stationary, of which 236 exist in both SCP-2249 and the Red Zone. ██ SCP-2249-2 have manifested during the Foundation's containment of SCP-2249. A laptop belonging to the late Dr. ███████ was discovered near his remains. Upon charging and minor repairs, a file labeled "Journal" was discovered, in which were multiple video messages recorded by Dr. ███████ detailing his experiences before the creation of SCP-2249 leading up to his death. Due to minor radiation damage, many files have been corrupted or damaged beyond repair. Remaining video transcripts relevant to research of SCP-2249 are available below. Entry begins, showing Dr. ███████, smiling elatedly and looking into the laptop's camera. Subject is a Caucasian male 26-30 years old, dressed casually and wearing glasses. Subject speaks in American English. The scene behind him appears to be a modest study, presumably within the subject's home before the creation of SCP-2249. A closed window provides no view of the surrounding area. Dr. ███████: "Ah, there we go. Well, hello whoever is watching this! My name, of course, is Delroy ███████, though if you're watching my personal journal entries then you probably know that. I've decided to document my life from this point on, I figure it might help me to organize my thoughts in some manner. And maybe I'll watch these one day when I'm an old fart and laugh at myself, who knows. Well, the main reason I'm doing one of these today is, drum-roll please,"
Subject reaches off screen, his face leaving the camera's view for a few seconds, before returning. Grinning widely, Subject holds an identification card bearing his picture up to the camera. The words "Dr. ███████, Pediatric Oncology" are written in plain black text, and appears to be from █████ ██████'s Hospital. Dr. ███████: "This right here is what I'm so excited about." ID is removed from camera's view. "The hospital here accepted my application, and I'm starting tomorrow! I've moved into my new place as well, it seems nice, and the neighbors came over to say hello earlier. We didn't have any trouble understanding one another, my Russian is apparently up to snuff." Rest of entry deemed irrelevant to research. Entry opens with mild distortion to video. Dr. ███████ is seen wearing blue scrubs, looking pensive. Dr. ███████: "Today was the first day. I don't know what I was expecting, I mean, I've worked in a hospital before. But, this one is just so… depressing. Now, █████ isn't exactly the most bright and cheery place itself, but it's as though they've taken all the dreariness of the landscape and magnified it within that hospital. The kids. Most of them seem as though they've given up on everything. If it wasn't for the amazing benefits, I'd be tempted to quit. As it is, I need a drink." Subject stands up and walks over to a drawer in his study, and pours a glass of alcohol. Subject returns to the seat in front of the computer and takes a long drink before continuing. Dr. █████ "I can't quit, I just have to stay and try to make things better. Or, something. I hate to see kids like that, it's not right. Alright. I'll talk to the boss tomorrow about maybe some enrichment programs. Maybe a garden or something? It's so grey out here." Entry starts with Dr. ███████ returning from work and talking about his day. Some fragments were damaged, and most irrelevant, until the 4 minute mark. Dr. ███████: "-left, and I was alone again. Well, I thought I was, until I turned and saw this elderly gentleman5. kind of strolling down the hall, looking into some of the kids' rooms. I of course immediately approach him and ask if there's anything I can do for him, ready to call security. Well, he just smiles and shakes his head no, looking like he's about to say something, then pauses. He looks up like he's considering something, then smiles at me again. He had an interesting voice, deep and gravelly." Dr. ███████: "'Well, perhaps there is something you could help me with. Or rather, something I can help you with.' What's that supposed to mean, I think to myself. Well, he goes on to talk about his ideas to 'spruce up the place', whatever that means. He asks me meet him, and well I was a little curious, so we're meeting on my next day off. Anyway, I had to go and-"
Entry begins with shaky footage from a camera being carried by Dr. ███████. A healthy forest, presumably SCP-2249, can be seen to either side. No signs of instability present. Sounds of children laughing, yelling, and talking can be heard in the distance. Subject stops, and the camera is lifted to point at a house, SCP-2249-1. Dr. ███████: "Ta-da! My new home, as of today! Everything is finally finished! I can monitor everything from here and keep an eye on the kids. " The camera is turned to show Dr. ███████'s face. Dr. ███████ "The kids are loving everything here. The other adults were a bit trepidatious at first, but they quickly got over their fear after they saw how much the kids were enjoying themselves." At this point video and audio are heavily distorted. Normal play resumed 32 seconds later. Dr. ███████: "Who knew something like this could be so easy? I mean, all it was was math and some elbow grease, and maybe some help from Charles. But I've got notes on all of that, this is not the time! For now, I just wanted to show what I've made. I've never done anything this important, and I don't think I will ever again. It's strange, thinking you've peaked so early in your life. Well, I should get going. Lunch is soon, then we're having a soccer match. Farewell!" Most footage from this entry was badly damaged, with the exception of an 8 second long section. Shot from the study's window on the second floor of SCP-2249-1, it shows a small instance of SCP-2249-2 about 5 meters away. Dr. ███████ is silent throughout. Entry begins, showing Dr. ███████ looking very distressed. General appearance is disheveled, and subject appears to be suffering from sleep deprivation. A dull roaring can be heard in the background. Dr. ███████: "Well. They're evacuating the town because I couldn't finish the machine by the deadline they gave. Some military types apparently have been asking what's going on. I'm torn between hoping they find me and drag me away, or staying. How the hell is someone supposed to stop a sub-universe from destroying itself in 10 days? And no one can seem to find Charles. Why would he abandon the town and me like this?" Subject stands quickly and paces back and forth, hands on the back of his head. After a few moments, subject returns to his seat. Subject takes a deep breath, and appears to be trying to calm himself. Dr. ███████: "At least now no one else will die. At least now, I can focus, no more distractions or worrying. I figure I can get this thing working in a week or so. I've got food to last a bit longer, and I can still get to the cafeteria for water. I think I should grab some of that first… no, I need to get back to work. Who knows what will happen if this thing fails. Best case scenario, it simply disappears, with me in it. Worst case? I don't want to think about it." Subject is silent for a few moments before ending the recording. Entry begins showing Dr. ███████, who is now extremely emaciated. His clothing is unkempt, and behind him multiple notes and blueprints cover the walls. The roaring heard in the previous video is much quieter now. Subject is unable to speak, presumably due to dehydration, and uses notes on paper to communicate. Dr. ███████, via note: "Got the machine working. Not feeling too great." Subject pauses to write something else. Dr. ███████: "I set it extend a path to the elevator. I'm safe for now. Should take a day. Maybe 2? Don't know. Then I can leave." Again, subject writes something down. Dr. ███████: "I can't save it. I failed." Subject puts down pencil and looks absently down at the floor. After a few minutes of silence, subject looks at the computer, then ends the recording. Incident report 04/28/20██.2249: Foundation operatives within the Russian Ministry of Emergency Situations (MCh S) were alerted to a possible anomaly in the town of █████ after a significant rise in reported cases of radiation poisoning and rising casualties, as well as civilian reports of "holes in the air". MTF Theta 13 was dispatched to investigate. Interviews of █████ residents did not immediately yield results; multiple persons were reported to say "he will fix it" or "just give him time". It wasn't until the interrogation of one ███ █████████ that the entrance of SCP-2249 was discovered on 05/01/20██, and on 05/02/20██ the path to SCP-2249-1 was discovered to be safe. 1. Flora within SCP-2249 exhibit none of the symptoms of extreme radiation exposure that would be expected. 2. Tremors and earthquakes occasionally occur within SCP-2249; while it is unknown how deep SCP-2249 extends, whatever foundation it has is surely being destroyed at a rate similar to that of the surface. 4. A cylindrical space with a radius of 3 meters, extending up and down for an unknown distance.